Abstract. At the present day, taking into account yearly increase of forensic science institutes workload, demand for high efficiency analysis methods introduction is more pressing than ever. This paper introduces non-conventional method of age determination of handwritten inscriptions and stamp impressions on documents. Keywords: forensic document examination, age determination of document processing, age determination of handwritten inscriptions on document, writing media, chromatography of objects of forensic analysis, spectroscopy of objects of forensic analysis, Raman spectroscopy. Research was conducted on handwritten inscriptions and stamp impressions applied with gel pen or capillary pen inks, ballpoint inks and stamp inks colored black and blue, containing specific dyes, applied to letter paper documents that were kept under the following conditions: (20±5) °C temperature, (70–95) % relative air humidity, (730–780) mmhg atmospheric pressure, no direct exposure to light, UV radiation and chemical reagents. Research algorithm includes dye type identification based on Raman spectrum appearance according to empiric classification used further in figures 1 – 3, tables 1 – 3 and measurement of relative intensities of lines for wavenumbers corresponding to particular dye type. Measurements of characteristic lines relative intensities were conducted using Raman spectroscopy. 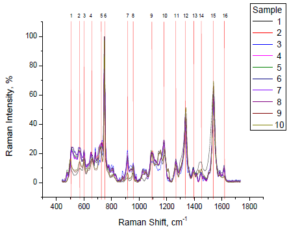 Raman spectra of handwritten text and stamp impressions were registered in the 440 – 1735 cm-1 range at 532 nm and 895 nm excitation wavelengths. Under these conditions general view of a spectrum is mainly determined by dye content of writing media [1, с. 947-951]. As time passes, dye degrades due to oxidation, hydrolysis and degradation (break up of large molecules into smaller fragment due to photoinitiated redox reactions) [2, с. 133] processes, thus allowing to use ratio of Raman spectra characteristic lines for expert assessment of written inscription date. 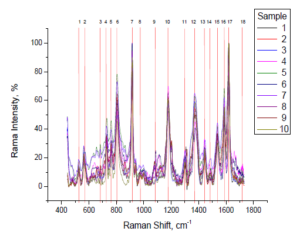 With the aid of device software, characteristic lines wavenumber values of studied ink Raman spectra were determined at 785 nm and 532 nm laser wavelengths. Characteristic line relative intensity was recorded using the “strong (S) – medium (M) – weak (W)” scale. Identification of writing medium dye type (phthalocyanine alcohol-soluble and water-soluble dyes, triarylmethane dyes and phthalocyanine pigments) was conducted via comparing appearance and position of Raman spectrum characteristic lines of a sample with data from tables 1 – 3. Writing media dye types were identified by match between wavenumbers and relative intensities of all the strong (S) and medium (M) lines with data listed in aforementioned tables. Conducting measurements by this algorithm ensures Raman spectra relative intensities measurement results in the range and with precision criteria listed in table 4 in confidence interval Р = 0,95. To evaluate content of highly volatile substances (2-phenoxyethanol, 2-ethylhexanol, benzyl alcohol, triethylene glycol, glycerin, etc.) in writing media and stamp inks, capillary gas chromatography method was applied. Study was conducted to determine composition of highly volatile components in pastes and inks from contract detail dashes on studied documents, contribution of highly volatile paper components was also accounted for. Samples researched included paper cutouts of record marks and cutouts of paper free of contract details. Cutout analysis was conducted using “Chromatec-Crystal” 5000.2 (Russia) gas chromatograph with solid sample injector. Conditions under which the chromatograms were obtained are listed in table 5. Cutouts (each about 1 cm long) were introduced into gas chromatograph vaporizer using the solid sample injector. Holding time of cutouts in chromatograph vaporizer – 1 min. Highly volatile components were identified via peak retention parameters comparison with highly volatile components comprising stamp inks, ballpoint inks, gel pen inks that were identified using chromatography-mass spectrometry (gas cromatography mass-spectrometer Shimadzu GCMS QP-2010 SE) and “NIST08” mass-spectra library. Age of contract details marks was established by relative content of highly volatile components in the marks. By “natural aging” of contract details we mean decrease of highly volatile components content in the marks when keeping documents at room temperature and under limited light exposure [3, с. 70-92]. According to results of study of different inks, dependencies of line relative intensities of age of ink application to paper. Every point on the graph is averaged value of corresponding lines ratio from 5 measurements for each sample. Along the X axis time that passed from the moment of ink application on paper base to moment of spectrum recording is plotted in months. Dependence of characteristic lines intensity ratio on time has a complex nature: it consists of three regions of monotonous variation of spectral properties and two extreme points. 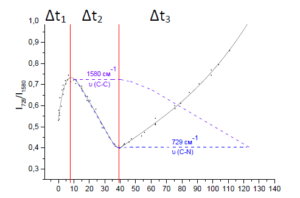 To plot the graph lines at 729 cm-1 corresponding to C-N bond vibrations and lines at 1580 cm-1 corresponding to complex C-C vibrations in chromogen [4, 5, 6] were chosen. Due to different nature of lines, sensivity of these vibrations to dye degradation is also different. Curve may be divided in three monotonous intervals (Fig. 5), presence of those intervals shows that prevalent processes change, resulting in complex shape of dependence graph of characteristic lines relative intensities on length of time passed since ink application to paper. Δt1: Ink plane transformation (volatile components vaporize, resins harden, data is obtained from writing media chromatography results). Δt2: N – demethylation. Dye methyl groups are continuously replaced by hydrogen under light exposure [7, с. 135-143]. Δt3: Photooxidative cleavage of central C-phenyl bond, resulting in appearance of benzophenones and phenols [8 с. 242-249; 9 с. 49-58.]. 1. Irina Geiman, B.S. Marco Leona, John R. Lombardi. 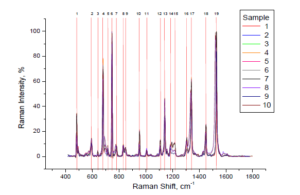 Application if Raman spectroscopy and surface-enhanced Raman scattering to the Analysis of synthetic dyes found on ballpoint pen links. J.Foresic Science, July 2009, vol. 54, N 4. 2. Safonov V.V. Photochemistry of polymers and dyes / V. V. Safonov. – SPb: Fundamentals and Technologies, 2014. – 296 p.
3. Batygina N.A., Bezhanishvili G.S., Orehova M.V., Trosman E.A. Establishing the fact of discrepancy between age of handwritten ballpoint inscriptions and date stated in the document. Forensic equipment, M., The Russian Federal Centre of Forensic Science of the Ministry of Justice of the Russian Federation, issue 122, 1993. 4. M. V. Canamares, C. Chenal , R. L. Birke, J. R. Lombardi, DFT, SERS, and Single-Molecule SERS of Crystal Violet, J. Phys. Chem. C, 112 (51) (2008), pp 20295–20300. 5. B. Doherty, M. Vagnini, K. Dufourmantelle, A. Sgamellotti, B. Brunetti, C. Miliani, A vibrational spectroscopic and principal component analysis of triarylmethane dyes by comparative laboratory and portable instrumentation, Spectrochimica Acta Part A: Molecular and Biomolecular Spectroscopy 121 (2014), pp. 292–305. 6.W. Meng, F. Hu, L.-Y. Zhang, X.-H. Jiang, L.-D. Lu, X. Wang, SERS and DFT study of crystalviolet, Journal of Molecular Structure, 1035 (2013), pp. 326–331. 7.M. A. Caine, R. W. McCabe, L. Wang, R. G. Brown, J. D. Hepworth, The Influence ofSinglet Oxygen in the Fading of Carbonless Copy Paper Primary Dyes on Clays, Dyesand Pigments, 49 (2001). 8.G. S. Egerton, A. G. Morgan, The photochemistry of dyes II – Some Aspects of the fadingprocess, J. Soc. Dyers Colourists, 86 (1970). 9.N. Kuramoto, T. Kitao, The Contribution of Singlet Oxygen to the Photofading ofTriphenylmethane and Related Dyes, Dyes and Pigments, 3 (1982).